He joined the grand alliance in presence of RJD leader Tejashwi Yadav and Rashtriya Lok Samata Party (RLSP) chief Upendra Kushwaha. Patna: Rashtriya Janata Dal (RJD) leader Tejashwi Yadav on Sunday welcomed Mukesh Sahni, who calls himself the son of Mallah (boatman) to the grand alliance. He joined the grand alliance in presence of RJD leader Tejashwi Yadav and Rashtriya Lok Samata Party (RLSP) chief Upendra Kushwaha. 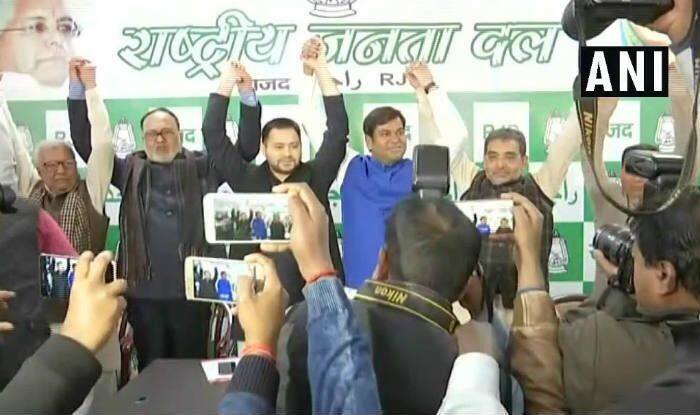 Former Bollywood set designer Mukesh Sahni, who calls himself ‘son of Mallah’ (boatman), on Sunday, joined the Congress-RJD-led grand alliance in Bihar for the 2019 Lok Sabha Elections. Sahni, who launched his own political outfit Vikasheel Insaan Party, is considered a popular name in the state politics and has a strong base in several parts of the state. The announcement of Sahni joining the ‘Mahagathbandhan’ came hours after the BJP president Amit Shah in a joint press conference with Janata Dal-United (JDU) chief Nitish Kumar and Lok Janshakti Party (LJP’s) Ram Vilas Paswan announced NDA’s seat-sharing formula for 2019 Lok Sabha elections in Bihar. Earlier, there were reports that Sahni may go with the BJP-led NDA. Yadav had on earlier occasion taken a jibe at the NDA Government at the centre stating there have been attempts to crush regional parties. On December 20, Tejashwi was joined by Hindustani Awam Morcha (Secular) founder Jitan Ram Manjhi and All India Congress Committee (AICC) in-charge for Bihar Shaktisinh Gohil. These parties meet came at a time when the NDA was facing flak from its own allies.